The crew started close to the marina catching slot-sized redfish. But with a slow bite, Capt. Walter made the call to run to Buras in search of trout. By the time the crew arrived, the tide had come to a standstill. If this ever happens to you, watch the episode to see how they overcame the conditions. 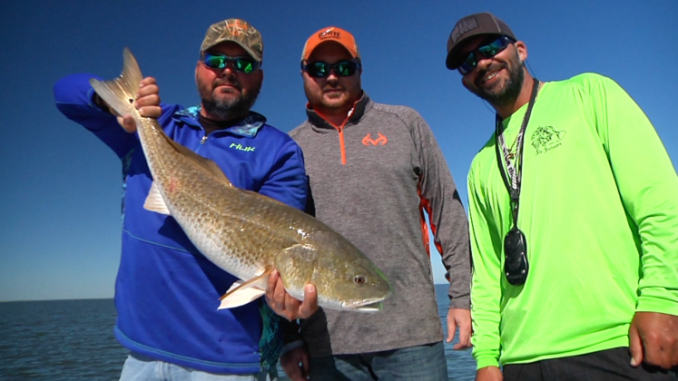 To finish the show, the group took Heathcock’s Blue Wave all the way down to South Pass in search of bull reds, where they found the bulls schooled up and hungry —catching a fish on nearly every cast. If you don’t have access to CST, you can watch the show on our YouTube channel or right here on LouisianaSportsman.com in the coming week. To subscrie to our YouTube channel, click here. Sportsman TV will air every week on CST until Aug. 31 on Thursdays at 6:30 p.m., Saturdays at 8:30 a.m. and Sundays at 9 a.m.